For a change, I have decided to use this blog to publicize a really nice article that was written by two of my colleagues for the January 2013 issue of The Column. For those of you who are routinely involved in the detection and characterization of aggregates, this article talks about some of the options available for the measurement and quantification of aggregates in biopharmaceutical formulations, that are available to you from Malvern Instruments. Aggregates above a few microns in size are characterized using visual techniques, while those less than 100 nm are typically studied using size exclusion chromatography (SEC). However, there remains a range of intermediately sized aggregates that are traditionally not so easily characterizable. Why are aggregates such a big problem? Well, as aggregates form in a biopharmaceutical formulation, the activity of the component proteins is likely to be lost, which could in turn reduce the efficacy of the product. Aggregates have also been shown to provoke an immunogenic response in certain individuals, which of course is highly undesirable! Therefore, understanding and monitoring protein aggregation in drug formulations is crucial to product quality. 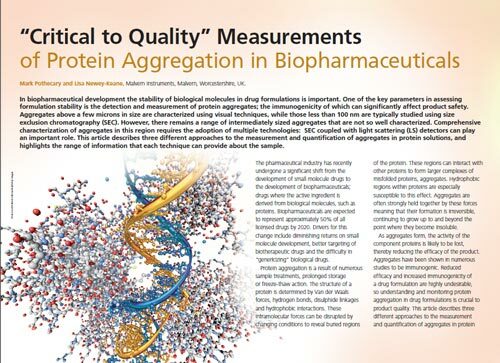 An article entitled “Critical to Quality Measurements of Protein Aggregation in Biopharmaceuticals“, now posted on the Malvern website, discusses this in more detail. Before I finish today, I would like to bring your attention to two upcoming events on this topic. On the 28th March, Malvern Instruments will be talking about biopharmaceutical analysis during a webinar hosted by Chemical & Engineering News, C&EN, and we will also be hosting our own webinar later this year to discuss some of the new technologies described in the article above. Keep an eye on the Malvern Events webpage to find out more, and register to attend.